Religion comes from the latin word “re ligare” meaning, “to bind back” or “to reconnect” – that is, to reconnect every individual to his real source. When this happens peace reigns. Every religion has provided humanity with signposts for right living and inner enquiry. Yet right through history, religious followers have carried out violence professing their faith at the same time. And in today’s world, we find religion being blamed for terrorist conflict. Is this right? Should we abandon our faiths for greater world peace? Here is a possible answer – the cause of the problem is not religion but selfishness, often born of ignorance and perverted education. Surely it is the emotions of anger, jealousy and hatred that lead to terrorism – not religion. True religion has, if anything, only preached love and service. 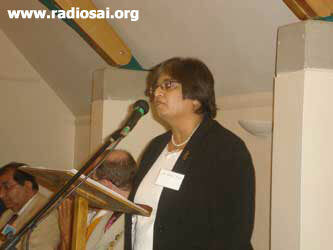 To discuss, elucidate and carry forward these sublime ideas of peace in a multi-faith and strife-stricken world and also to mark the fifth anniversary of 9/11, the Sathya Sai Human Values Network, UK, recently hosted an enlightening human values based forum - ‘Our Search for Peace in a Climate of Terrorism’. Before we go on to share with you the inspiring ideas that emerged in the forum, a little about the organizing team – the Sathya Sai Human Values Network. 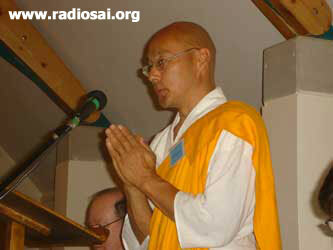 The Sathya Sai Human Values Network (SSHVN) is a non-profit making website. 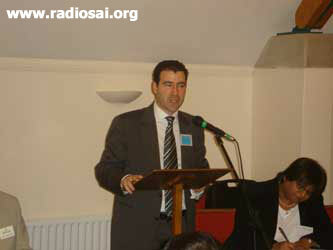 [www.sshvn.org] initiated by the Three Counties Group, UK through their study groups on human values. It was approved by Bhagawan Baba in 2004 and since then it has a programme of ongoing development of reaching out to the global community through the universal message of human values. 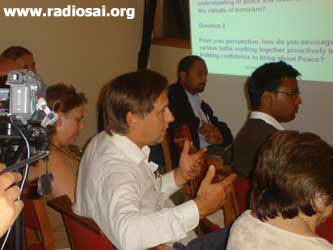 The ethos of the Network is to share knowledge and learn to enhance our understanding of human values. Based on the Sathya Sai Human Values Program, it seeks to integrate human values into all aspects of our lives for the betterment of society and to develop an online resource to share best practices from a human values perspective. There are human values designed here for an individual’s personal growth. 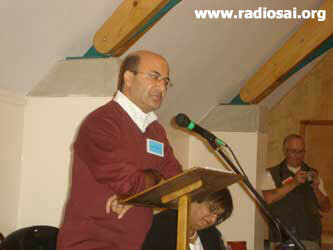 So how did the idea of a multi faith panel discussion come about for an online forum? It was simply the need felt by the team to do more, to be more proactive. To address the need for human values in dealing with global issues, such as terrorism, environment, climate change, etc., which affect all individuals and discuss these issues in a lively setting with enlightened minds. To raise people’s awareness on Human Values inherent in all faiths and to utilise them to promote Peace, Well Being and Harmony. 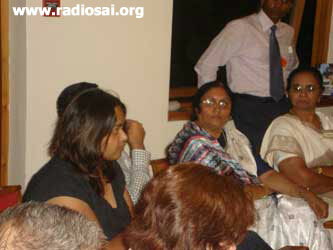 The response from distinguished leaders was encouraging and the forum had six leaders from six different faiths sharing their views when it was opened on Sep 13, 2006. 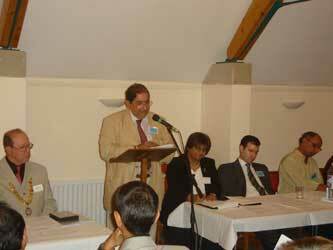 The panel consisted of the following eminent invitees from the local community. 1) How can faith help bring about peace and reconciliation in the current climate of terrorism? 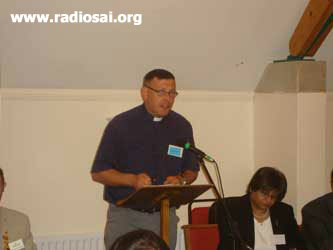 2) How can the different faiths work together proactively to bring about peace? She mentioned that against the backdrop of the anniversary of the atrocity at the Twin Towers in New York, it was a hundred years ago on September 11, 1906, that Mahatma Gandhi started his protest movement towards peace in South Africa by applying the moral laws of Truth and Non-Violence to the social realm. 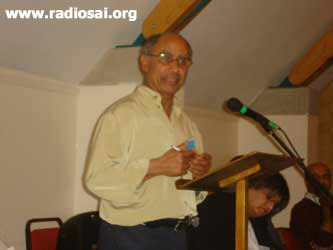 Dr. Trivedi quoted Albert Einstein, who said that peace can only be achieved by understanding and not through force. She also commented that just as war begins in the minds of men, so should peace begin in the minds of men. 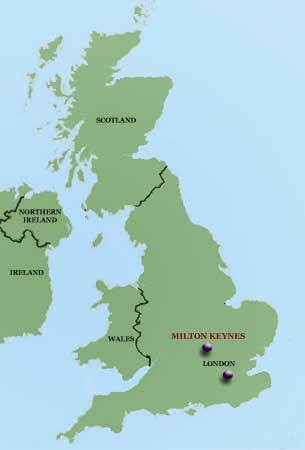 The Mayor of Milton Keynes was the chief guest of the event and in his short address, he said that Milton Keynes became one of the International Peace Messenger Cities in 2003. Local authorities have a responsibility to establish a culture of peace in their areas. A documentary on “Unfair Trade,” highlighting the issue of slavery, historical and present-day, was produced by the city’s youngsters. On the issue of diversity, the Mayor said that Milton Keynes ’ 40th Anniversary celebrations next year will involve 40 different nationalities. Dr. Trivedi thanked the Mayor for his speech and initiated the discussion on “The Search for Peace” by posing the questions to each of the Panel members. Qs. 1) How can your faith bring about an understanding of peace and reconciliation in this climate of terrorism? “Humans were born to do good, and the ultimate good is to relieve the suffering of many,” Rev. Handa Shonin Sama (Buddhism) said. “We need to ponder on the source of people’s suffering and eliminate the root causes. We need to venerate all others as they are all Buddhas. When everyone and everything becomes an object of veneration, peace will prevail.” Rev. Handa Shonin Samawas was born in Japan and left at an early age to live in the ashram of His Holiness Nichidatsu Fuji in India. 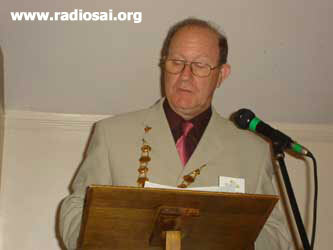 He came to Milton Keynes to help build the Peace Pagoda and has contributed tremendously towards peace in the community. 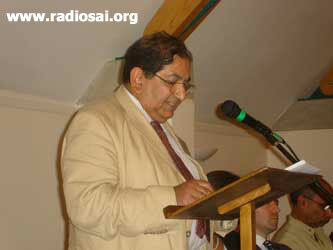 Mr. Fazle Khundkar who is involved in community work through Action Aid, the Society of Friends of the Lotus Children, Interfaith group in MK, the Peace and Justice Network of MK and the Council of Racial Equality, further said, “The five fundamental principles of Islam had no mention of jihad or the perpetration of violence on non-believers. Violence and terrorism are not in the core values of Islam. 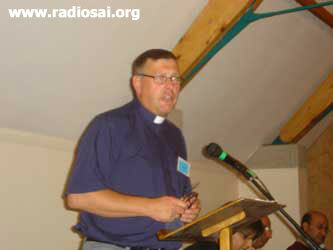 “There was a small pacifist group within the Church from the early days. However, in the name of the faith, many people had perpetrated violence and instigated many wars. At the heart of the Christian faith is the hope that all people will live in peace and harmony. Christianity strives for peace by seeking union with God and seeks a resolution for violence. Peace cannot happen without justice (e.g., for the Palestinians). In the Christian faith the aim is to find the violence within oneself and confront this. Those without power are first within God’s kingdom.” Truly, it was something profound to ponder and assimilate for every Christian. Mr. James Eckhardt (Judaism) who spoke next was a founding member of Jewish-Arab Dialogue in the 1990’s. A student of Kabalah and Jewish mysticism, in the course of his thought provoking talk, he said, “Judaism is a complex religion, with a written law, an oral law, commentaries, the Kabala, etc. 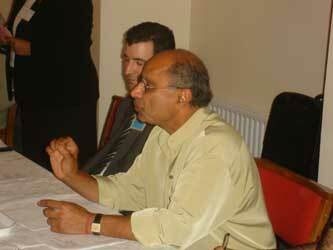 Explaining the concept of Hinduism and its tenets, he said, “There is a difference between faith and religion. Hinduism is not technically a religion. 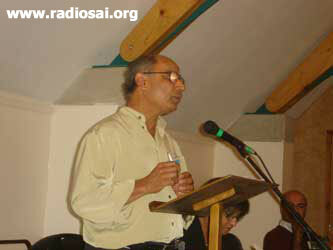 Hindus believe in a certain path or way of living.” Later on developing Dr. Trivedi’s opening remarks, he said, “Peace begins in the minds of children. Children have to be taught the fundamentals of human values. We will then get children who can communicate with each other. The law of Karma brings us all together – for every action there is an opposite and equal reaction. In the Hindu doctrine, there was the concept of personal responsibility. Qs. 2) From your perspective, how do you envisage the various faiths working together proactively in building peace? Mr. Fazle Khundkar answered by noting that “The cooperation of faiths has been in existence for a long time, especially in India. While there have been examples of ruthless conquerors, there have also been generous Muslim rulers in India and Spain. Mahatma Gandhi, together with the impact of Subhash Chandra Bose, brought about independence for India. Mr. Jehangir Sarosh who spoke next gave examples of how religious communities can bring tremendous positive change and said, “In March, religious leaders and Ministers from Iraq were brought together in London, in secret. 800 religious leaders from across the world (especially conflict zones like Sri Lanka, the Middle East, Sierra Leone , etc.) were brought together in Japan. Q: In the current climate when there is such strong negative media influence, how do you provide a counter balance from your faith’s perspective to promote human values in dealing with conflict? Rev. Tim Clapton: We have violent video games, etc. these days, but we have choices. We must offer our children alternatives. Mr. Kapil Dudakia: Each of us is a drop but many drops can make a difference. We need to go back to our core principles. Mr. James Eckhardt: We can intervene and teach children how to react with calmness. We have a great deal of power and opportunity to influence people. Mr. Jehangir Sarosh: Individual responsibility can go out to the community. The faith communities can play a part. Q: With the decline in faith in God, how do we rebuild faith? Will this rebuilding take us to peace and understanding? Rev. Tim Clapton: There is a decline in religion in the West but there is a mushrooming of interest in spirituality. Our task, as people of faith, is to address people on this quest. Violence within us is a reality, and faith needs to address this. Mr. Jehangir Sarosh: There is a tremendous hunger for spirituality and experiential religion. Globalization has led to greater awareness and faith in wanting to reconnect. Q: Most religions monopolize truth and are exclusive. Consequently they contribute to violence and the absence of peace. How do we empower individuals to confront the authoritative power inherent in some religions and the political and economical hegemony (imperialism) of the world powers? Rev. Tim Clapton: In Christianity, the community is more important than the individual. If you want to be great, you have to be the servant of everybody. You have to learn humility. Mr. James Eckhardt: We must have the vision of being brothers. If we look at terrorist organizations, a schism usually appears between the moderates and the extremists. This itself is a shift in consciousness. Hezbollah and Hamas are going for peace. They are considering giving up arms to concentrate on the social work they have been doing among their people. Mr. Fazle Khundkar: There are many examples where terrorists are not Muslim, for instance in Sri Lanka. There can also be state terrorism. Islam is against terrorism because it results in indiscriminate killing. A Senior Officer from Her Majesty’s Prison, Woodhill: There is a difference between fundamentalism and radicalization. We have animal rights terrorists. The Muslim terrorists in Woodhill have largely done what they did because of anger fuelled by marginalization and lack of opportunity, and not on behalf of Islam. At Woodhill, they have time to reflect on their actions, and have become better Muslims as a result. Youth Worker: Peace comes from understanding and knowledge. Teachers need to play a role in communicating religion to youth. Mr. Jehangir Sarosh: There’s a lot of work being done in building networks. Youth Groups (Muslim, Catholic, and Jewish) are being brought together. Rev. 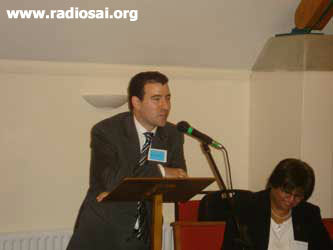 Tim Clapton: In Northern Ireland there was a well-funded project to bring Protestant and Catholic youth together. We need to do similar work with the Bangladeshi youth in Bletchley, and also the Somali youth in Milton Keynes. Mr. Kapil Dudakia: If we want to effect change, we need to do it in the formative years, when it is easier. We should impart human values starting young. A quick fix is not possible. There is a lack of resources. Members of the panel agreed on the importance of working together to raise awareness of unity through more forums. 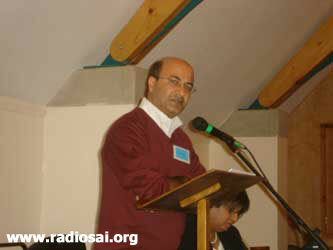 Dr Trivedi thanked the Mayor, the Panel Members, the guests and the organizers and invited all the participants to continue the discussion on the website of the Sathya Sai Human Values Network at www.sshvn.org. 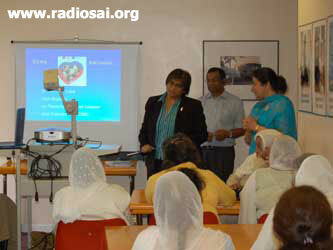 Apart from providing an interactive website on Human Values for the local, national and international community to discuss how values could enrich life, the Sathya Sai Human Values Network also takes up many community-based events promoting human values in action through partnerships working periodically. 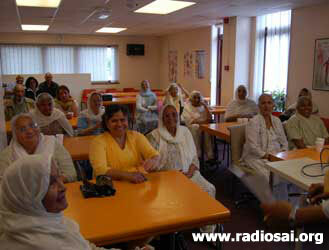 For instance, the team conducted a series of Health Awareness Sessions for senior citizens of the local community in Hertfordshire, UK. With the help of charts, posters, videos and leaflets in various languages, the team provided a holistic approach to better health which stresses on prevention through promoting healthy life styles and stress management followed by health checks. Spread over four weekly sessions in the Ravidaasa Community Centre, they educated the elderly citizens on prevention of diabetes and related risks, improving bone health and prevention of Osteoporosis, prevention of cancer, overcoming depression, etc. The SSHVN team also recently worked with Rainmakers, an International folk Dance Group based in Letchworth Garden City, UK to support a local hospice where a good friend known only for his years of selfless service passed away recently. Rainmakers provide joy through cultural music and dance from different countries to many people in the community including entertaining the elderly and the lonely in their community homes. 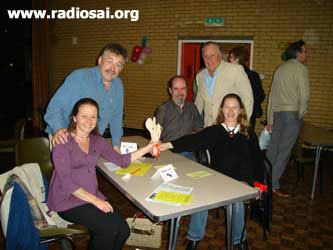 SSHVN and Rainmakers jointly hosted a charity ‘Quiz Night’ in memory of Mr Adrian Barter. World renowned author Mr Frederick Forsythe graced the occasion with a memorable talk and anecdotes and more importantly greatly appreciated the value of selfless service towards such a cause. We at Heart2Heart wish the Sathya Sai Human Values Network team all the best in their novel endeavours and hope the network team kindles the spark of right living in the minds of many and spurs them on towards their individual and collective human excellence.